Funerals Begin In Tornado-Ravaged Moore, Okla. : The Two-Way Among the first to be remembered is 9-year-old Antonia Candelaria, one of 7 children killed at their elementary school. She and her best friend, Emily Conatzer, were holding on to each other when they both died. Funerals Begin In Tornado-Ravaged Moore, Okla.
Players, coaches and parents collected donations Wednesday in Oklahoma city for the Angle Family, who lost their daughter Sydney, and their home, in the tornado. Sydney was No. 35 on a softball team called 'Bring It'. Funerals began Thursday for the 24 people known to have been killed by the tornado that devastated Moore, Okla., on Monday. Nine-year-old Antonia Candelaria, one of the 7 children killed at Plaza Towers Elementary School, was being remembered at a local church. Her obituary says that "Tonie" and her best friend Emily Conatzer "were inseparable, even in their last moments, they held on to one another and followed each other into Heaven and they will never be alone." -- Officials now estimate that up to 13,000 homes were damaged or destroyed and that the total about of damage done could exceed $2 billion. -- The number of injured is thought to have exceeded 370. -- "While anguish over the deaths was palpable as residents began picking up their shattered neighborhoods," The Associated Press writes, "many remained stunned that the twister didn't take a higher human toll during its 40 minutes on the ground." -- The names of all 24 victims have been released. Oklahoma City's KFOR-TV has posted audio recorded on one teacher's cellphone as she and her students sought shelter from the tornado in one of Briarwood Elementary School's bathrooms. As you can imagine, the children were terrified — so we caution against listening if you think it might be too disturbing for you to hear. No children died at that school. "Dozens of girls and their parents lined a two-mile stretch of SW 89th St. in Oklahoma City. 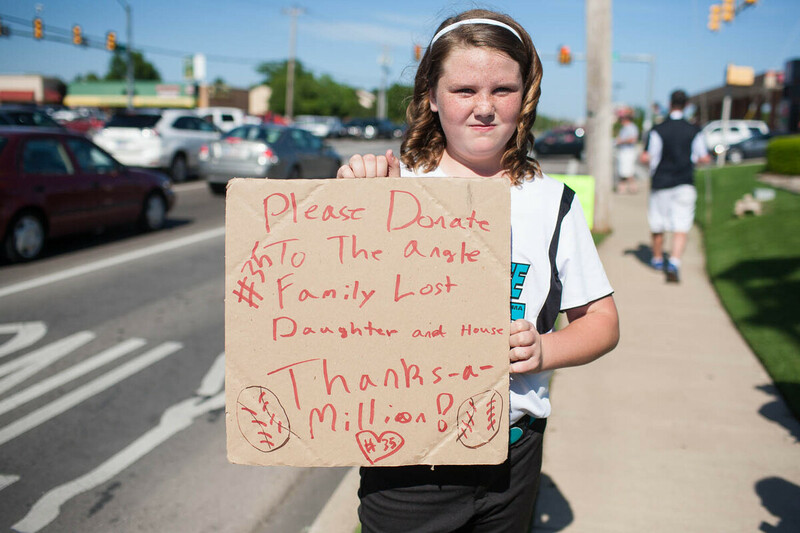 They were members of a girls' softball league collecting money from passing drivers for the family of Sydney Angle, 9. The family lost its house in Moore. Sydney lost her life at Plaza Towers Elementary. She was No. 35 on a team called Bring It." Oklahoma Gov. Mary Fallin's office has emailed reporters to say that the official figure on the number of people known to have been injured by Monday's tornado is now 377. That's 24 more than had been reported on Wednesday. Meanwhile, NPR has posted an interactive graphic that allows users to zoom in on satellite images of the storm's destructive path. There's also an interactive view of the damage on this page from the Google Crisis Response team. "A moderate risk of severe thunderstorms for Thursday afternoon and evening across a small portion of northwest Texas. Supercell storms are forecast to develop in this area, which could result in very large hail and a few tornadoes. A slight risk of severe thunderstorms exists for portions of Texas and Oklahoma, as well as parts of the Northeast U.S."
-- Teachers In Moore Gather For 'Sharing And Healing'. -- Photos: Recovery Begins In Tornado-Hit Area. -- Oklahoma Officials Toss Around Storm Shelter Issue After Twister. -- Oklahoma Tornado: Finding Aid, Giving Aid.